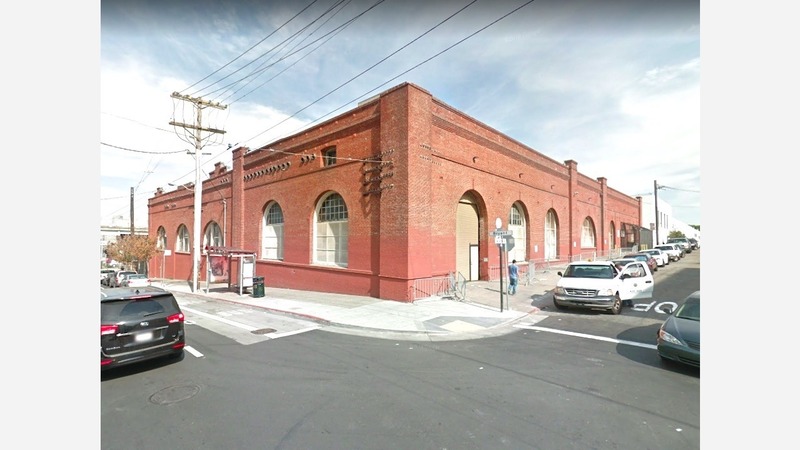 The San Francisco Arts Commission announced plans to collaborate with Animal Care and Control (ACC) and Public Works to commission artwork for a new animal shelter planned at 1419 Bryant St. (and Alameda). Two years ago, the historic Municipal Railway Overhead Lines building constructed in 1893 was selected as the new shelter's location. According to SocketSite, the building's exterior will be preserved, but the warehouse will be gutted to create "a new second floor and 5,000 square feet of open air dog runs." The art project description states that proposals should highlight the open-admission animal shelter, which offers housing, care and medical treatment to wild, exotic and domestic animals. Artworks are expected to harmonize with public spaces and the design of the new site, while taking into consideration the conditions inside the planned shelter. Four finalists were chosen to submit proposals, including Michael Bartalos, Mona Caron, Rupert Garcia, and Favianna Rodriguez. Visual artist Bartalos, who works and lives in San Francisco, said in his project description that he wants to depict the range of species of ACC with the aim of engaging the public's interest. His proposal consists of sculptural metal artworks whose lighting, context, and dimensionality bring animal imagery to life, Bartalos wrote. 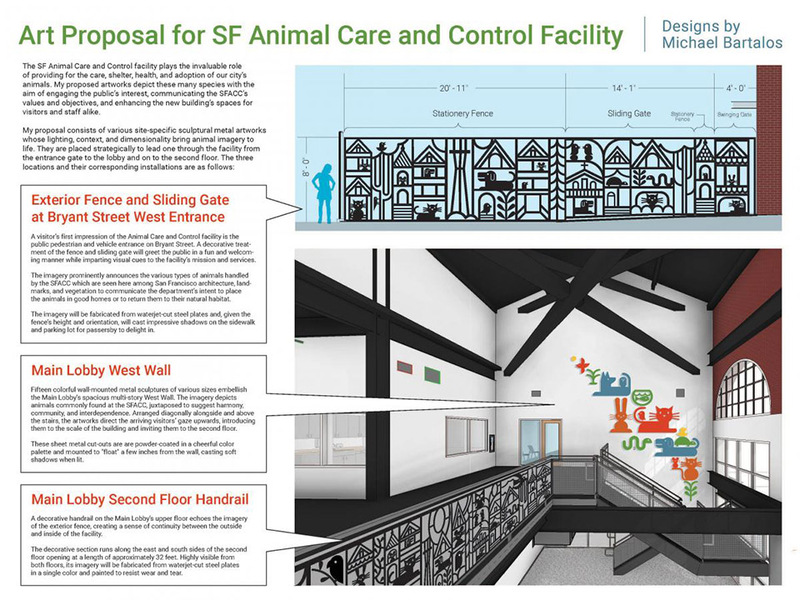 If his creation is chosen, a decorative handrail on the main lobby's upper floor will reflect the imagery of an exterior fence, where he wants to show dogs, cats and other species handled by the shelter's staff. 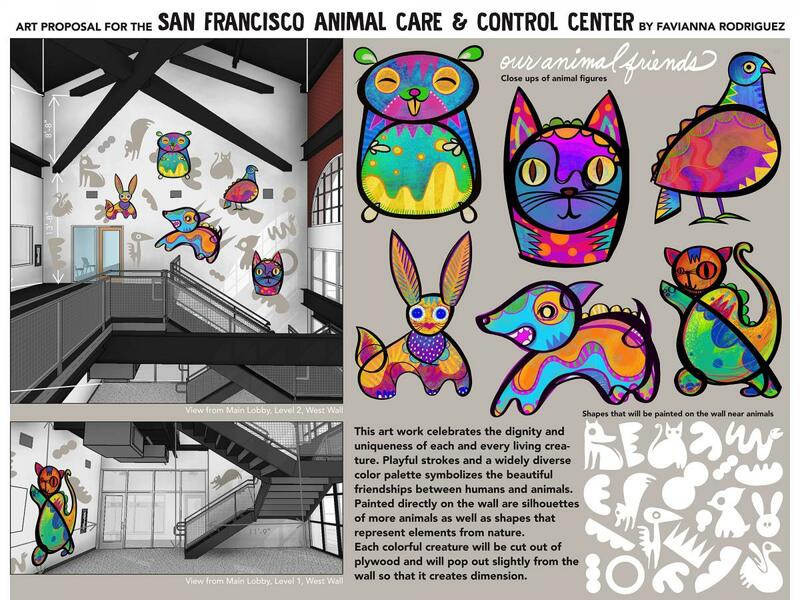 Swiss-born and San Francisco-based muralist Caron intends to provide an immersive and soothing experience with her creations, which are set to elevate the emotional aspect of animal care. 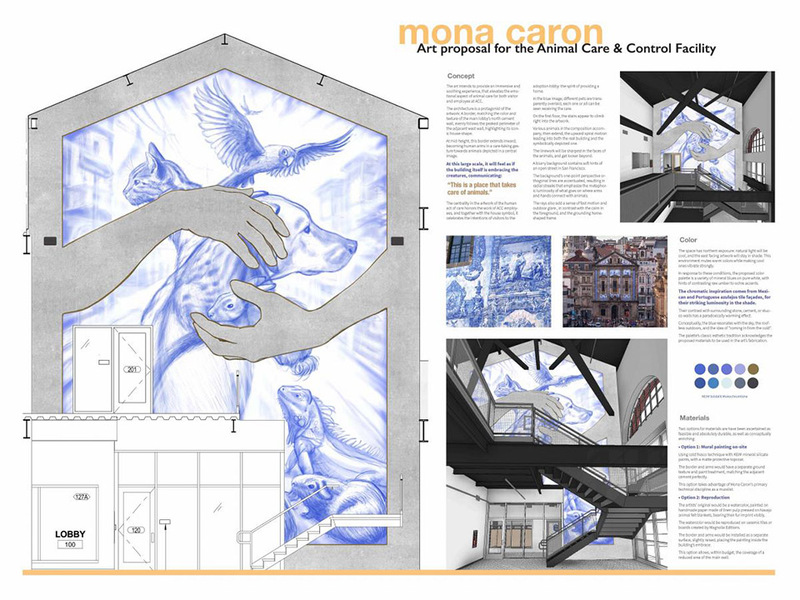 A mural that would be installed on the main lobby's north cement wall features human arms gesturing towards animals, embracing that the shelter is a place of nurturing and care. The blue hues of the mural will resonate with the sky, the roofless outdoors, and the idea of coming in from the cold, wrote Caron in her project description. 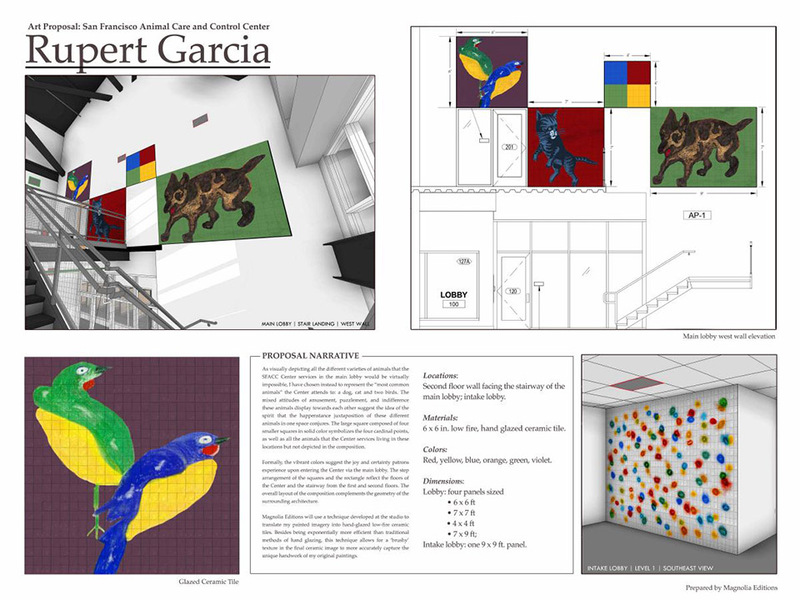 Oakland-based Garcia wrote in his description that it's impossible to visually encompass the varieties of animals that ACC welcomes, so he decided to present the most common animals; a dog, a cat, and two birds. Low-fired hand glazed tiles would be placed on the second-floor wall facing the stairway of the main lobby. Garcia said he plans to collaborate with Donald Farnsworth and Magnolia Editions in Oakland to produce the tiles. Interdisciplinary artist Rodriguez, who also lives in Oakland, said her art would celebrate the diversity, beauty, and dignity of all living creatures. "My aesthetic is playful, colorful, and designed to speak to the imagination of viewers of all ages, including children and youth," she wrote. Her approach resembles Sumi ink drawings, traditionally used in East Asian cultures for calligraphy and brush painting. Rodriguez wants to help viewers imagine what an animal may mean in their own life and to "travel into a galaxy of possibility." The public comment phase for the project concludes today by 5pm. Notes can be sent to sfacpublicartcomment@sfgov.org, or delivered to 401 Van Ness Avenue, Room 325. A final selection panel meeting will take place on May 9.